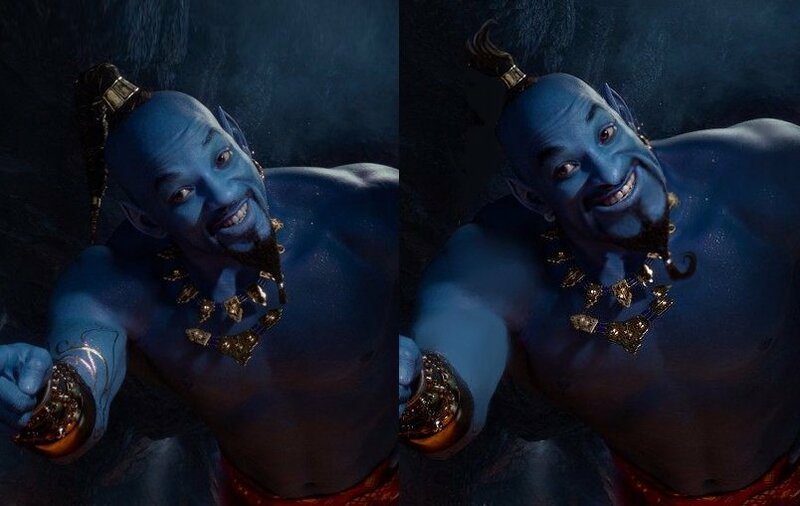 It's really weird how ripped they made his CGI back. That's how it happened in the movie. Genie comes out, looks like this great muscular being and then quickly reverts to dad-bod Robin Williams genie. Lol... Smith is in his 50s to be fair to him. It's definitely creepy as F. They should have left the best on. The good news is they still have time to fix it. I saw this and thought it would make for an "easy" correction on their part. It's short, its sweet, and it looks good. Tolkien was such a big part of my life. I've re read his books countless times over the year starting at age 11. He was the beginning of my infatuation with fantasy. To me Tolkien IS fantasy, nothing else hits the nail on the head the way his world building did. I got chills from that trailer, really looking forward to this movie. Last edited by GreenLantern; 02-12-2019 at 11:52 AM. Wow... that might actually make it better to be honest. Intrigued to see what direction they are taking this. Feels like they are almost going full super hero Elsa in Frozen 2..."What happens if we blend together The Avengers, Frozen, and the Incredibles all together...". Like even Kristoff riding the Moose through the forest felt like a clip right out of the Avengers: Infinity War trailer. Looks like Disney will be reigning box office champs again this year. I would find it hard to believe they don't break $8 bil worldwide. Last edited by TheyCallMeBruce; 02-13-2019 at 09:01 AM. I think you could easily argue they actually have too much releasing this year and it could hurt the individual totals of some movies. Feel like Dumbo (stuck between Captain Marvel and Avengers), Aladdin (stuck between Avengers and Toy Story), and Artemis Fowl could all under perform at the box office. Even then though $8B would probably be doable considering just Avengers, Frozen 2, and Star Wars might be good for $5B just themselves. Last edited by SuperMatt18; 02-13-2019 at 09:27 AM. Lol. Aladdin has bigger problems than its release date. Can't find any global totals for each studio. I'd agree with you normally, but most of those films are just a license to print money. The Generation that saw Aladdin, Dumbo and The Lion King as kids now have their own kids and are going to eat those films alive. Star Wars is almost always a Home Run regardless of whether the movie is any good or not and I think Captain Marvel and End Game are going to surprise the hell out of people. Disney is going swimming in their Scrooge McDuckian vault of cash this year. Really the teaser didn't look bad outside of the Genie. And that probably will still be huge internationally in other markets and think it will still do well domestically as long as the full trailer looks good. People had the same concerns about Beauty and the Beast when the first teaser trailer for that movie came out...it did $1.2B worldwide. Yeah looking at it more closely and $8B is probably conservative for Disney this year. As you mentioned Toy Story, Aladdin, and Lion King will be a licence to print money due to nostalgia and them being some of the most popular Disney franchises ever. Even Dumbo which I am concerned by the release date could overachieve because of the trailer looking really good, and Tim Burton having a pretty good following. Plus I actually didn't realize how well Alice in Wonderland, Beauty and the Beast, Maleficent and Jungle Book live action movies had performed either, for some reason thought they were a disappointment but they all did at least $800M worldwide. If Dumbo, Lion King, and Aladdin can perform to expectations of the previous live action remakes then Disney probably has a shot at $10B worldwide box office for movies released in 2019. That's $10B right there and those totals probably aren't that aggressive. Last edited by SuperMatt18; 02-13-2019 at 09:48 AM. The Lion King is going to be outrageously big. I do a box office pool at work and everyone is underestimating it aside from me. Like, really? You guys know they did the same thing with Jungle Book which has maybe 10% the popularity The Lion King does and it made almost $400M. Beauty and the Beast made $500M and isn't as popular as The Lion King. And it's the last big summer release of the year, mid-July, it could own the box office for three months. It's going to be BIG. TIL there is such thing as a box office pool, and that there are places people work that enough people care about it to actually participate. People will bet on anytime, it seems. ]The Lion King is going to be outrageously big. [/B] I do a box office pool at work and everyone is underestimating it aside from me. Like, really? You guys know they did the same thing with Jungle Book which has maybe 10% the popularity The Lion King does and it made almost $400M. Beauty and the Beast made $500M and isn't as popular as The Lion King. And it's the last big summer release of the year, mid-July, it could own the box office for three months. It's going to be BIG. Wouldnt surprise me one bit if it was the highest grossing film of the year. I am looking forward to Endgame because I think it marks the close of a chapter of film-making history and the beginning of another, I consider it a landmark, but it wouldnt surprise me if Lion King makes more money.